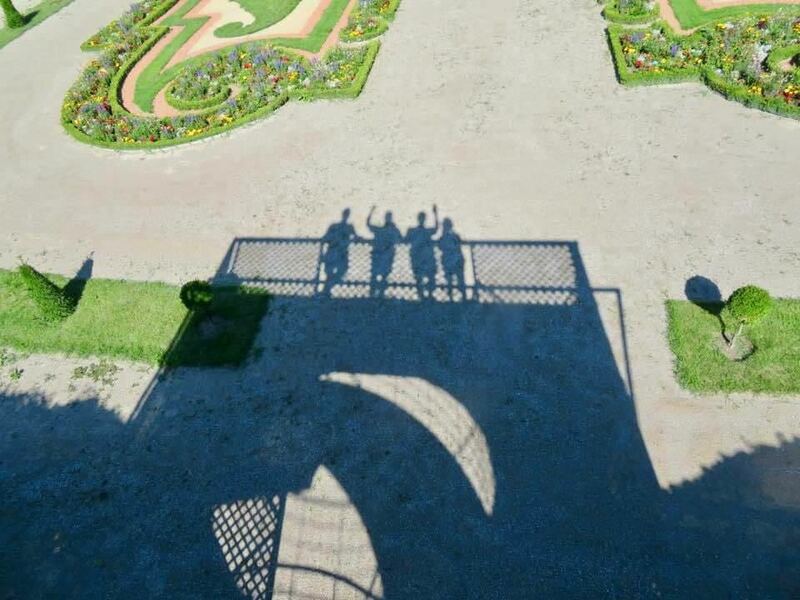 Alan, Susan, Jeff and Greg on their trip to Europe last year. 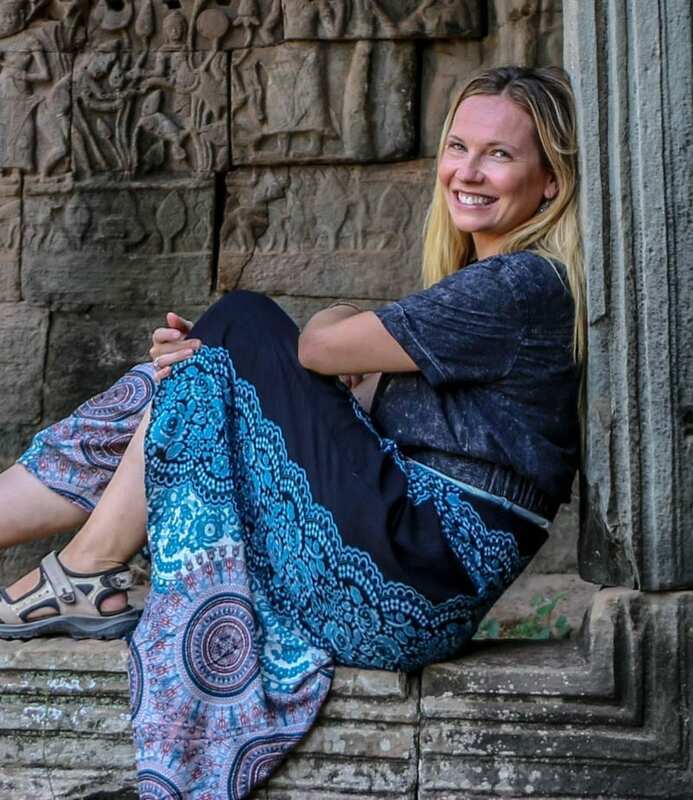 After Jeff died, I decided to walk in his footsteps and it is a moving experience to follow the itinerary that Jeff and his family experienced so recently. And, with all the walking, I dropped all the weight I gained after four months of stress eating back in Chicago. Bonus! One of my favorite subjects to read, write and learn about is WWII, so I was – and am – delighted that so much of what they did involved exploring WWII sites. I was especially excited about the Hospital in the Rock. 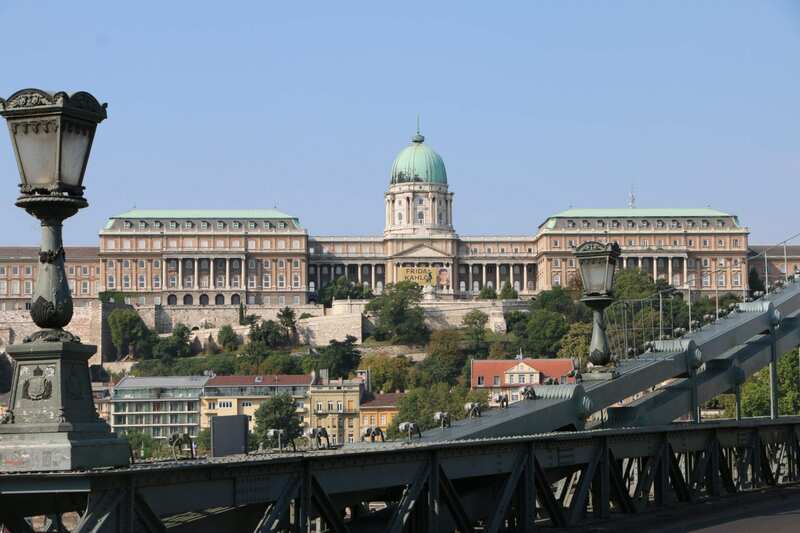 Beneath the beautiful Buda Castle, there is a labyrinthine of limestone caves, carved from the same hot water of the thermal baths and spas that make Budapest famous. The caves have been used since Medieval times for various reasons, including hiding riches from tax collectors, and one of the cave systems beneath the castle became a hospital used by the International Red Cross during WWII and, later, during the Hungarian Revolution against the Soviets. During the Cold War, the cave was converted into a secret nuclear bunker and, because of this, the museum now hosts an exhibition about the aftermath of the nuclear bombs that the United States detonated over Hiroshima and Nagasaki to bring an end to WWII. One of the stories from the aftermath was that of “Saduko and the 1,000 Paper Cranes”. 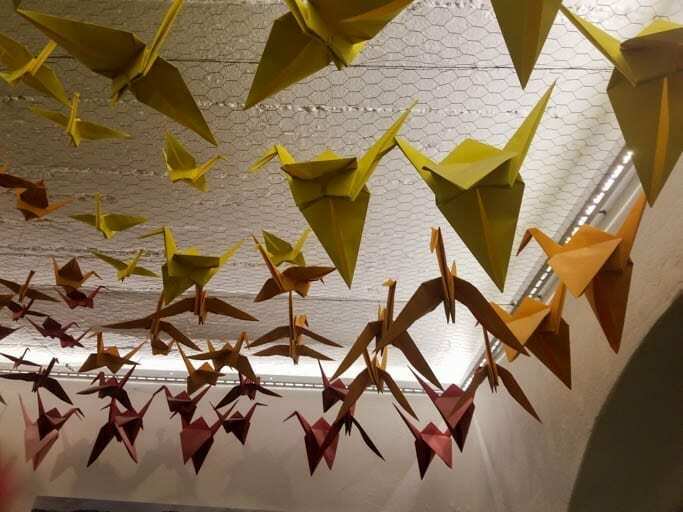 Inspired by a Japanese legend that says that anyone who folds 1,000 origami cranes will receive a special wish from the gods, 12-year-old Saduko set out to fold her cranes when she was diagnosed with Leukemia 10 years after the bomb “Little Boy” was detonated near her home in Hiroshima. 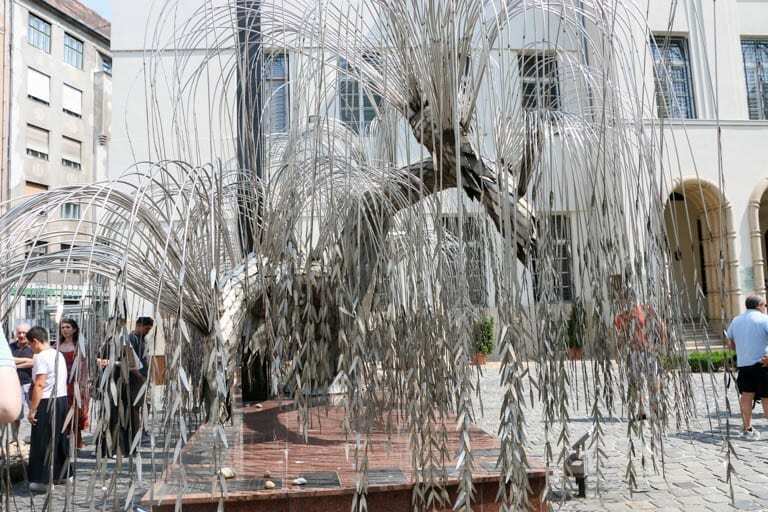 Though Saduko never finished her cranes, her friends and family finished them for her and she was buried with her 1,000 cranes. 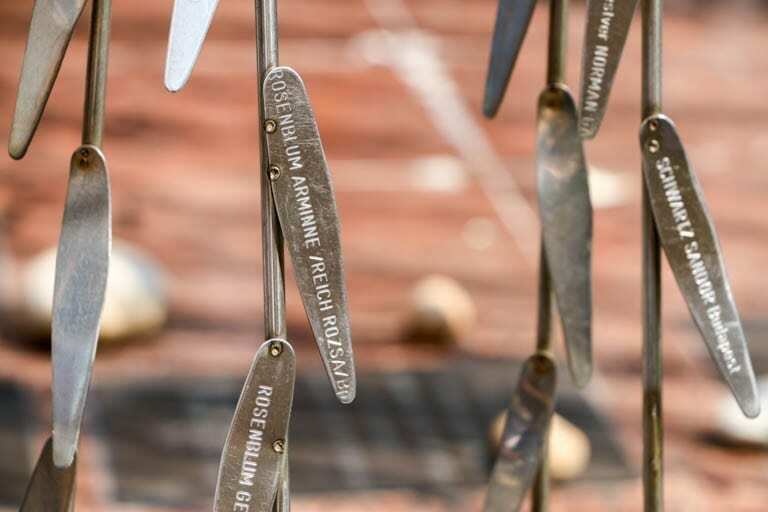 She and her cranes inspired a short book and became a symbol for all those battling cancer. For Jeff they were a symbol of hope and love when friends from all over the United States sent him thousands of cranes when he got sick. For the Hospital in the Rock, the cranes are a symbol of peace. It was surreal to hear Saduko’s story in that hospital far under the ground, and it was moving to walk under the same ceiling full of cranes that Jeff would have walked under one year ago. There are no pictures allowed at the Hospital in the Rock, but I figured they wouldn’t mind this one. 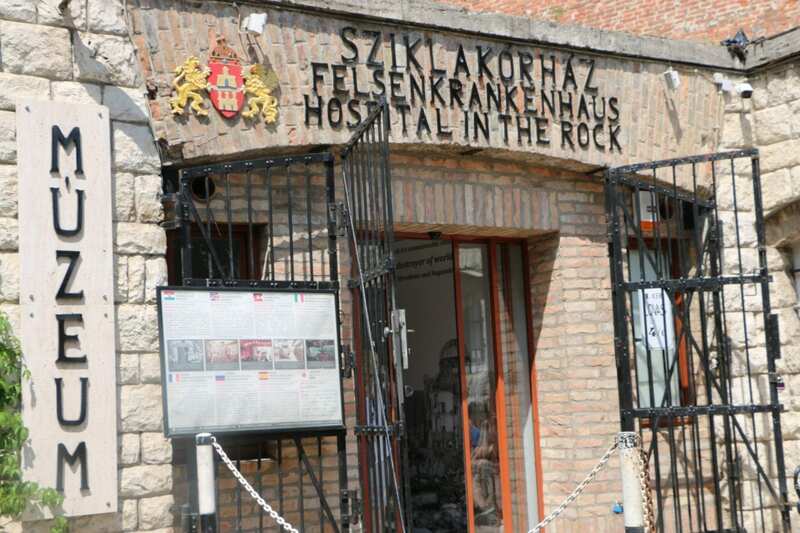 The caverns of the Hospital in the Rock are deep underground, so it was the perfect place to cool off after a 90-degree hike up Gellért Hill. 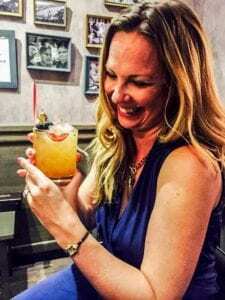 A tradition established by the Elko family on their trip was to find a hill, a bridge or (in the case of Vienna) a bar that allowed them to see the whole city and, therefore, orient themselves. 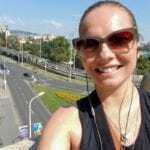 So, for me, Day 1 in Budapest meant a hike and, despite the heat, it was a perfect way to get to know Buda and Pest, which were two separate cities until 1873. Separated by the Danube River, they remain separate in their character and atmosphere. Buda is residential and marked with rolling hills, churches and a quiet beauty. Pest is where people work and play. It is a bit grittier and boasts the famous Ruin Bars. 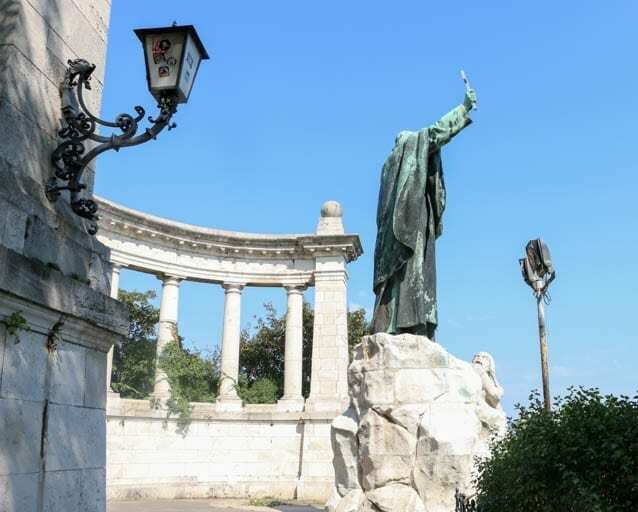 Gellért Hill is named after Saint Gerard of Csanád who, as legend has it, was placed in a spiked barrel and rolled to the bottom of the hill to his death during the Pagan Uprising in 1046. This is the spot where Saint Gerard was thrown from the hill that is now named for him. At the top of the hill, Hungary’s Liberty Monument towers above Budapest from her spot as part of the city skyline. When first erected in 1947, she was called Liberation Monument and dedicated to the Soviet heroes who liberated the city from Nazi Rule. Following the revolution of 1956 and the fall of communism in Hungary in 1989, sentiments changed toward the Soviets. 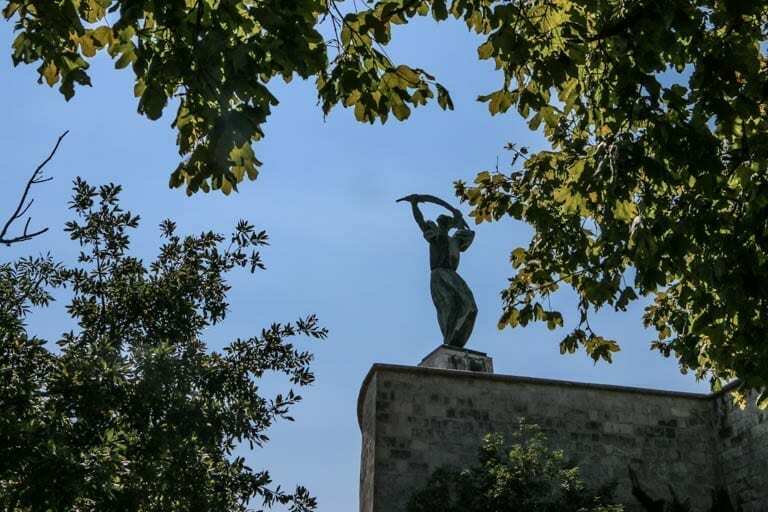 The monument was subtly renamed Liberty Monument and the inscription adjusted to commemorate all those who sacrificed their lives for the freedom of Hungary. I returned to this memorial three times during my five days in Budapest. I’ve seen many memorials throughout Europe dedicated to the senseless slaughter that took place during WWII, but this one really spoke to me. 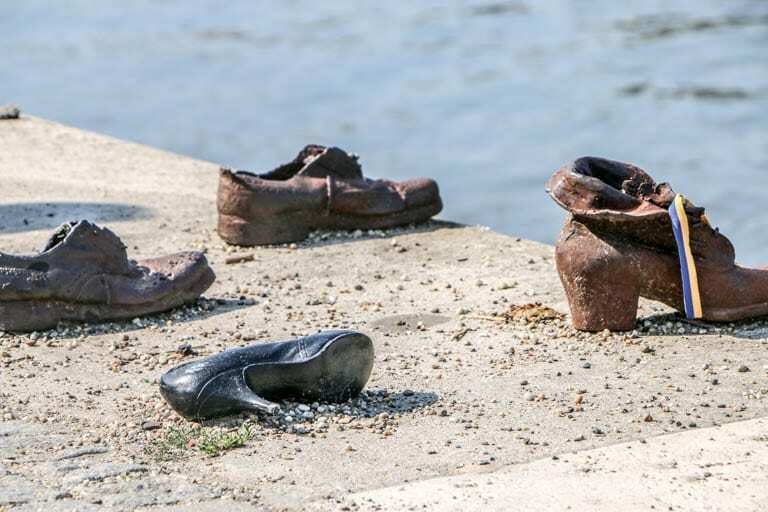 Its location on the banks of the Danube is not only a beautiful place to contemplate, but symbolic in that this view of the river was the last view that many Jews in Hungary saw as the ruling Arrow Cross Party routinely rounded up people from the nearby Ghetto, lined them up, faced them toward the water, and shot them in the back of the head. The shoes themselves are the “soles” of men, women, children, businesspeople and Jews. A symbolic representation in iron of the fact that nobody was safe. Finally, the fact that Hungary acknowledges here that it wasn’t just the Nazis that committed mass atrocities is touching in its honesty. Hungary fought with the Axis Powers and alongside German soldiers for much of WWII. 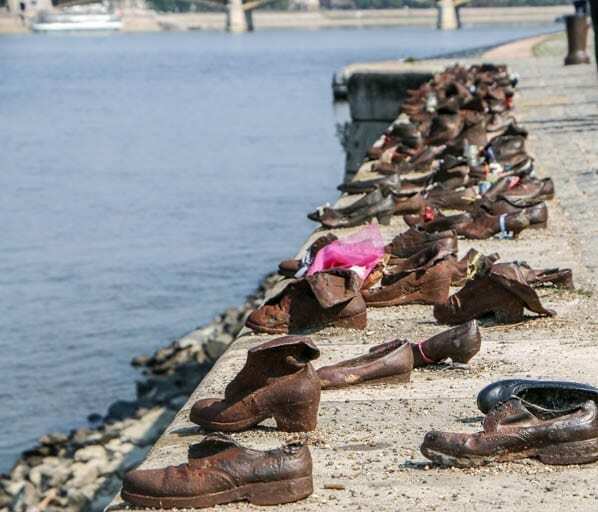 Though the atrocities along the Danube, the building of hasty ghettos, and the mass deportations began only after the German occupation of Hungary in April 1944, it was all with the support of the Arrow Cross Party, a Hungarian political organization. 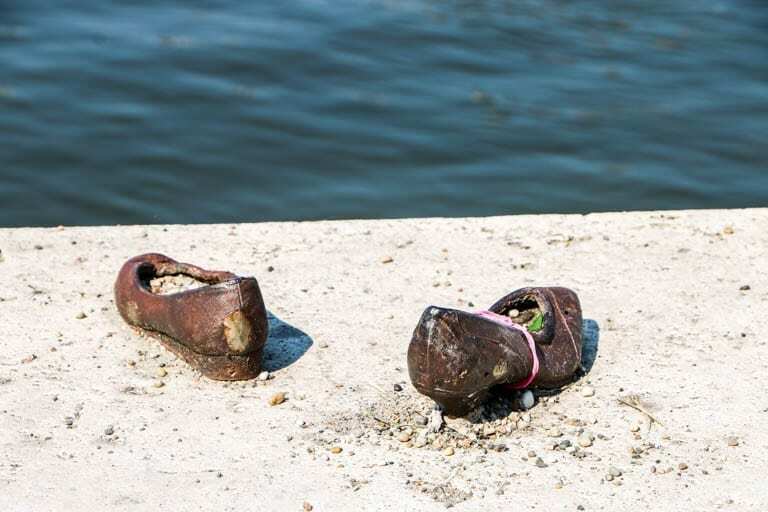 The Shoes on the Danube serve as a frank apology to those who lost their lives here. Just up the street from the Danube, the largest synagogue in Europe sits on Dohany Street in Pest. It is also the only synagogue with a cemetery since it is not customary to have a cemetery next to a synagogue. However, during the German occupation of Hungary, the Budapest ghetto enclosed the synagogue and, when the Russians liberated the ghetto in January 1945, 2,000 people who died of starvation and winter weather were hastily buried in a plot next to the synagogue. It is Hungary’s largest mass grave. Sitting in the cemetery, I took it all in. 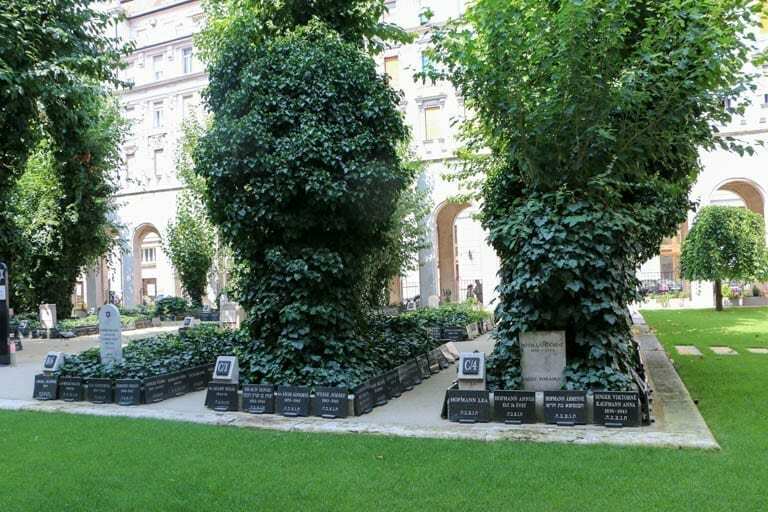 The gravestones placed by families that were able to identify the bodies of their loved ones, the way a preserved piece of the original ghetto wall juts up against the cemetery, and the “Tree of Life,” a weeping willow sculpture with the names of those killed in the Holocaust inscribed on its leaves. The itinerary called for lots of history and lots of walking, but there was also plenty of room for a little light-hearted fun. I was told that Jeff and Greg visited the Tuk Tuk lounge, so I did the same and enjoyed the cocktails at the Thai-influenced lounge. But my favorite tip was the one to visit Ruin Pubs. Ruin Pubs are built in Pest buildings that would otherwise be torn down and furnished with the tossed away furniture of old cinemas and abandoned flats. I went searching for a Ruin Pub combined with my favorite thing – a market. 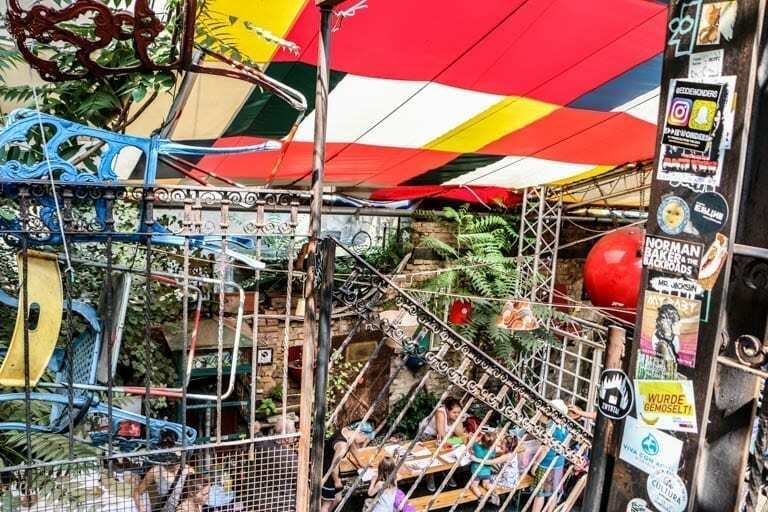 Szempla Kert is an old factory converted into an open-air cinema and pub and, on Sundays, the whole place is taken over by the lively sounds of bartering as vendors sell fresh fruits, cheese and truffle oils. 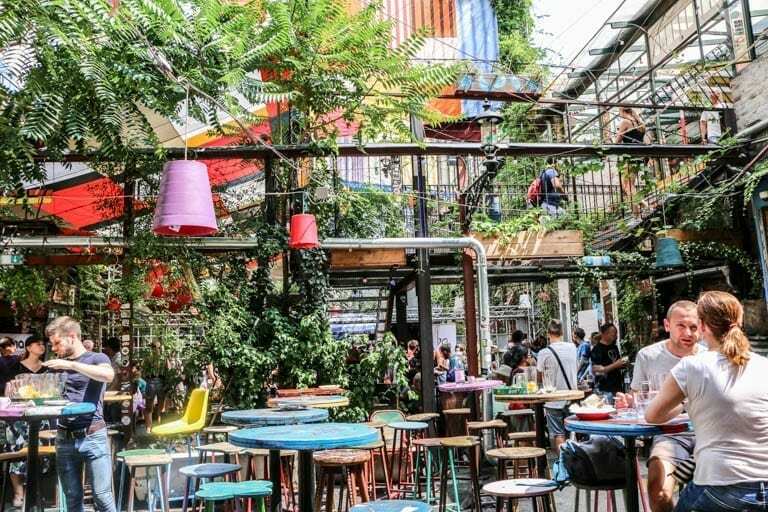 These familiar market sounds are all the more enticing in a place that looks like it might topple in on itself at any point from the weight of so many decorative items and plants balanced and growing in every which way. The tabletops are sometimes striped in purple and white, sometimes solid blue, all with mismatched stools. Large flags drape between two piped walkways and, upon closer inspection, the flags are made up of other flags. The backs of ornate, brightly colored chairs are used to decorate everything, they are set atop handrails, they hang from ceilings, they topple sideways above shrubbery covered overhangs. A horn player jams next to a Goulash stand beneath lights made up of upside down, multi-colored trash cans. 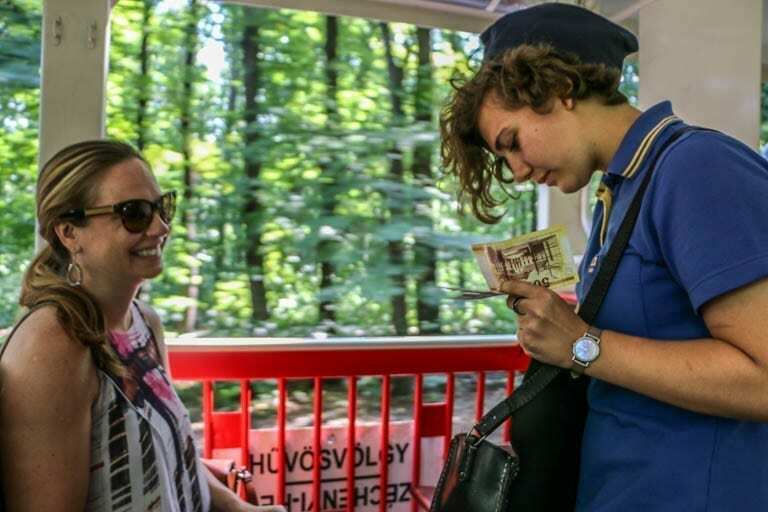 On my last full day in Budapest, I set out to find the Children’s Railway, a small rail service that covers the Buda Hills and – as the name implies – schoolchildren fill various roles around and onboard the trains. I was warned that Jeff and family had a very difficult time finding the Railway, so I set out prepared with specific directions. I took a tram to the Cogwheel Rail but got a bit nervous when the Cogwheel Rail turned out to be in a seemingly abandoned station with a red railcar angled straight up a hill. After about 20 minutes, people suddenly appeared and bordered the railcar, and we headed straight up the hill. Then, out of nowhere, about four stops before the top of the hill, everyone got off the train. Note to self: When everyone gets off the train, it’s best to follow. I stayed behind and ended up back at the bottom of the hill. I was told to take the cogwheel back to the stop where everyone got off and then find the bus. I did this, but my bus stopped after two stops. I got off, took another bus, did some quick work on Google Translator, abandoned my plan to make it to the top of the hill, and hopped off at a stop that claimed to be the Gyermekvasút (Children’s Railway). There was nothing there but a café. So, I sat down, ordered a beer and, after cooling off from both heat and frustration, I asked the server. It took some time in my broken Hungarian and his broken English, but finally, he just pointed to the trees in front of me. 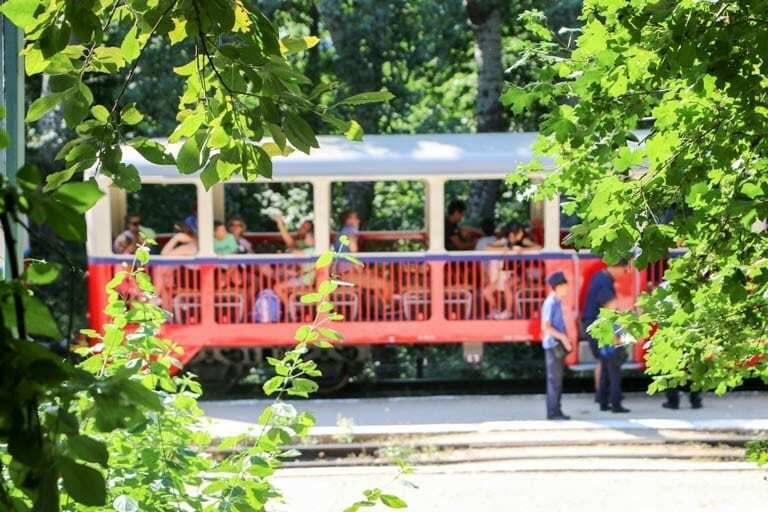 Sure enough, just beyond the trees, a little red train rolled by. I walked along the tracks until I found the little station. Once aboard, sure enough, a couple of children took my money. 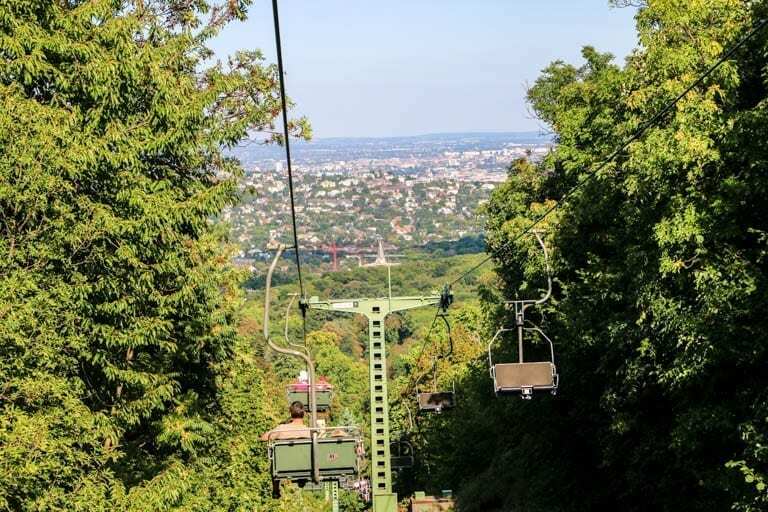 I rode the train a couple of stops until János-hegy (János Hill) and the highest point in Budapest. Getting hopelessly lost generally ends in great reward and that was certainly true this time. I rode the chair lift down and enjoyed the views – and the breeze! I write this post from Jeff’s favorite city of Vienna. As I’m nearing the halfway point of this trip to follow in his footsteps, I am grateful that Alan and Susan did not wait another year to take their sons on an epic adventure. I’m so very grateful that Jeff had a chance to see all of these things. I can almost hear his laughter and feel his delight at every stop. This is lovely Jen. I really enjoy reading your blogs.